When you are pregnant, you are breathing to get enough oxygen for you and your baby. As you progress, breathing becomes more difficult as your baby grows larger and needs more oxygen, and it will also start to press against the vital organs for breathing. You will also need lots of help breathing for labor. It is best to start early. Breathe slowly and take deep breaths at least once every day. Doing this for ten to fifteen minutes is a very good practice. As you move forward in your pregnancy, you can work this into your exercise routine. Many of the yoga routines designed are lively, invigorating, almost dance-like. They get your breathing and circulation working optimally and the vigorous arm movements and upward stretches, plus deep breathing, help blood circulate through the abdominal organs and bring fresh, nourishing blood to your baby via the placenta. This exercise really focuses on upper body stretches to open the chest and loosen the shoulders. The movements wake up the whole of the upper spine and dissolve tightness in the neck, shoulders and arms – this is particularly helpful if you spend a lot of time sitting at a desk or driving a car. These movements also create more space in the abdomen, so that your digestive system has room to function and your baby has room to grow. Sit with knees a comfortable width apart and feet firmly planted on the floor. Tuck your coccyx under so that your pelvis is level – imagine that the pelvis is a bowl of water and you don’t want to spill any of it. Stretch up through your spine from the base to the crown, with your neck long and shoulders relaxed and down. Breathe in deeply to open and lift the chest. Hold the lift as you breathe out, drawing your shoulder blades together with arms relaxed and then pushing the palms down toward the floor with fingers spread wide, to end with straight arms. Repeat, pushing down against imaginary resistance with each breath out and relaxing your hands as you breathe in. Repeat, but this time start with your elbows bent and hands pointing up as you breathe in – this is so that you create a greater push downward as you breathe out. Make your movements graceful and rhythmical, rather like a seated dance. Then, on each breath out, push strongly away from you to the sides, with your palms at shoulder level (the picture shows mid-push; you finish the push with straight arms). Engage the muscles around your spine and the back of your waist as you push. Relax as you breathe in. Repeat rhythmically. On an out breath, stretch your palms to the sides with arms raised as high as you can, engaging your upper arms and back muscles. Finally, repeat the arm movements in reverse order, moving down until your arms are beside you. Repeat the whole sequence several times. This movement should be done rhythmically and with enthusiasm. It loosens up all the joints from your heels to your fingertips and blows away the cobwebs from your mind. Stand with feet comfortably apart and knees well bent, and rotate your upper body from side to side, making sure your arms are loose and relaxed. Keep your spine upright, your hips and legs steady and your centre of gravity low. Now stretch your arms right up to the right and clap your hands. Then sink into the previous position before stretching up to the left to clap your hands. Keep breathing deeply and vigorously as you alternately sink and relax then stretch to each side in turn. Getting your legs, rather than your lower back, to support your increasing weight and bulk is probably the most important postural adjustment that you can make during your pregnancy because it will save you from backache. Your womb is situated in the lower abdomen, which is held in place by the spine at the back, the pelvic girdle below and the hips on each side, so it has nowhere to expand as your baby grows except upward and forward. Any upward growth is constrained by your digestive organs and diaphragm, so most of the bulk has to move forward. This extra weight should flow downward through strong and well-toned legs, restoring your vital balance and centre of gravity. Stand with legs a comfortable width apart, feet firmly planted and knees loose. Stretch your spine upwards, taking your weight downwards through your legs. Press your palms together at throat height with elbows out to the sides. Breathe in and expand the lungs at the back by opening your back ribs more. As you breathe out stretch your arms forward and bend deeply at the knees. Hold a moment, then breathe in again. Repeat often. Pregnancy is a crucial period for women. Consult your doctor before beginning an exercise program, because your doctor needs to assess your fitness in relation to your pregnancy. 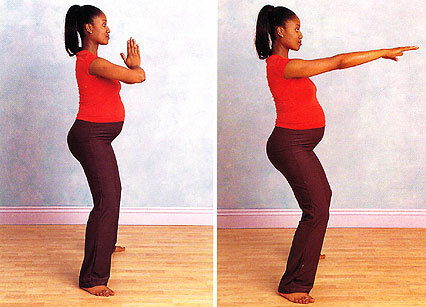 Exercise during pregnancy, is beneficial, both physically and emotionally. During pregnancy, women encounter a lot of problems, like excessive weight gain, varicose veins, insomnia, fatigue etc. and these may be alleviated by exercise. If you exercise during pregnancy, you will have a better posture, your circulation improves, your backaches are reduced, and you have a general sense of well-being. 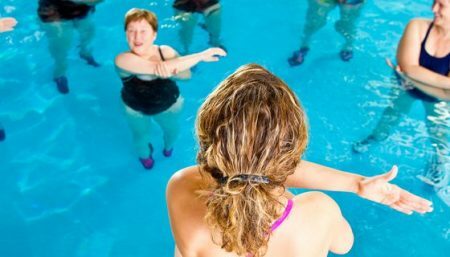 Only a well-balanced exercise program will offer you these benefits. It’s definitely good for your baby too.